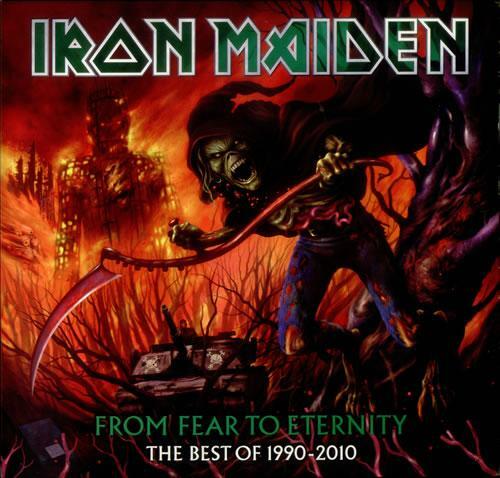 Iron Maiden - "From Fear To Eternity: The Best Of 1990-2010"
EMI are proud to announce the release of ‘From Fear To Eternity: The Best Of 1990-2010’. A double-CD set spanning twenty years this follows the huge success of 2010’s studio album ‘The Final Frontier’ which hit the number one spot in 28 countries around the world. It also became the band’s highest-charting album in the USA where IRON MAIDEN have just been awarded their first Grammy for Best Metal Performance, for the song ‘El Dorado’, taken from ‘The Final Frontier’ album, and which is included in this selection. Iron Maiden’s current phenomenal global success has seen the band not only scale new-found heights aided by their unique method of touring, using a customized Boeing 757 - named Ed Force One by their fans - to transport band, crew and all their equipment round the world to many new places, but has meant their ever-expanding fanbase now encompasses a brand new generation of metal lovers. ‘From Fear To Eternity’ is a chance for these new fans of the band to explore Iron Maiden’s rich history, with the highlights of their last eight studio albums distilled into this handy collection, which follows 2009’s compilation of their earlier work, the 1980-1990 ‘Somewhere Back In Time’ album.Perennial favourites to be found on this album include songs also featured in Maiden’s current ‘The Final Frontier World Tour’ set list; tracks such as ‘Fear Of The Dark’, ‘The Wicker Man’, ‘Blood Brothers’ and ’Dance Of Death’ sit alongside recent classics ‘El Dorado’ and the hauntingly evocative ‘When The Wild Wind Blows’. It also include singles like ‘Holy Smoke’ and ‘Be Quick Or Be Dead’ together with more progressive thought-provoking album tracks like ‘Afraid To Shoot Strangers’ and ‘For The Greater Good Of God’. This new collection charts the musical development of Britain’s most successful metal band as they have evolved their sound, producing longer, more complex songs, gaining huge critical acclaim in the process. Featuring many of the epics for which the band has become renowned, it is accordingly released as a double-CD, but will retail for the price of a single album.